The Helix offers serious fun all the way around with a 360 degree flume. It's rotomolded construction provides strength and durability for years to come. 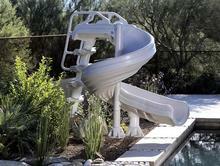 The TurboTwister gives you water park thrills in your own back yard. Whether it's the rushing water or thrilling dips and curves that you love. 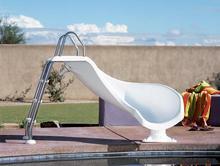 This full-sized rotomolded slide stands 7'4" tall to the top of the handrails, and is available in sandstone or grey granite. The 6' G-Force 2 slide packs a thrilling 360 degrees ride that brings the amusement park excitement home to your back yard. 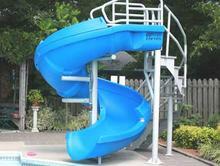 The 6' X-stream 2 pool slide boasts an exhilarating 2-turn ride that will impress all the kids in the neighborhood. 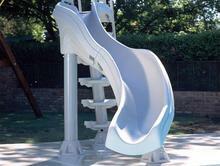 The 6' Wild Ride slide offers up a fantastic thrill ride for the most discriminating of sliders. 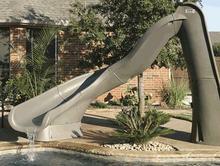 Complete your backyard oasis with a fun Pool Slide from Pool Xperts. 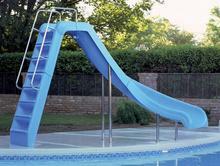 The Vortex multi-market, open or closed-flume slide is available with a ladder or a spiral staircase...you decide. Create your own, custom slide....the BYOS2. BYOS2 sections are wider, deeper, and delivers more water. 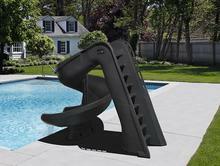 CAD design available to help you create your own custom backyard water park. 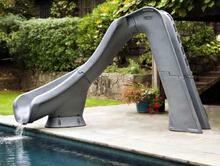 This 3' Zoomerang water slide is kid sized, and packed full of fun. The Zoom Flume water delivery system provides lots of rushing water like a water park.